KLCC (Holdings) Sdn Bhd (KLCCH), the owner of Malaysia’s tallest building, the Petronas Twin Towers, will lose its bragging rights when The Exchange 106 and Menara PNB 118 are completed. But it will not be long before the company regains its crown as it plans to build a 700m building called Tower M within the Kuala Lumpur City Centre development. Construction of the office tower atop a retail podium will commence on a four-acre site near Jalan Binjai in Kuala Lumpur after 2030. Industry estimates put the gross development value (GDV) of the yet-to-be-named skyscraper at between RM3.7 billion and RM4.2 billion. 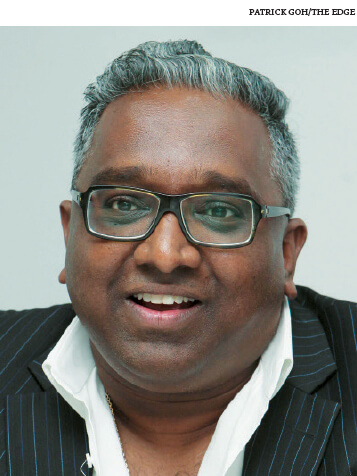 When asked for his comments, Zerin Properties CEO Previndran Singhe is full of praise for the proposed development. “It is a fabulous idea. By 2030 to 2035, the city would have developed further. KLCC Holdings is looking ahead and will help make KL and Malaysia a commercial centre for Southeast Asia. Data from the Skyscraper Centre, the global tall building database of the Council of Tall Buildings and Urban Habitat, ranks the Petronas Twin Towers as the 12th tallest building in the world. The Skyscraper Centre has yet to include the 700m tower in its list of upcoming developments. Rising 492m over 106 levels, the aptly named The Exchange 106 will trump the 451.9m, 88-storey Petronas Twin Towers by the end of this year. But it will, in turn, be relegated to second spot when Permodalan Nasional Bhd’s 630m Menara PNB 118 is completed in 2024. Another skyscraper called the Tradewinds Tower — news reports had its height at 775m but the Skyscraper Centre puts it at 608m — could also illuminate the Kuala Lumpur skyline. However, this mega tower appears to have been put on the back burner. The tallest twin structures in the world, the Petronas Twin Towers are expected to remain so in the foreseeable future. It is worth noting that skyscraper rankings are based on height and not the number of floors. 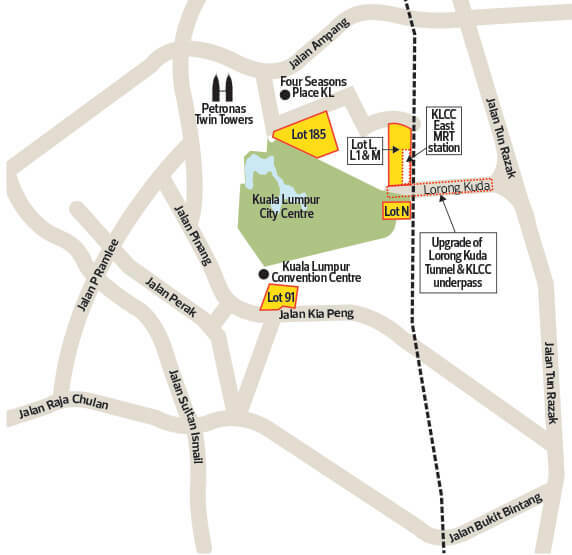 Asked to confirm plans for Tower M, a spokesperson for KLCCH says the proposed tower has been designed to soar up to 700m, and that it will be built on Lots L, L1 and M next to the MRT KLCC East Station (see map). The number of floors is not stated but the tower is reportedly 145 storeys high. Using the heights stated by the Skyscraper Centre as an indication, the proposed Dubai One project, at a height of 711m, will house a total of 161 floors while the Tianfu Centre in Chengdu, at 677m, will be 157 storeys high. “When the government announced the MRT Line 2 project in 2010, it involved a station to be strategically located to provide further connectivity to the KLCC precinct,” the KLCCH spokesperson says. “On May 4, 2017, MRT Corp (MRTC) and KLCCH signed a mutual agreement that paved the way for the integrated transit-oriented development comprising four basement levels (car park), one concourse retail level and four retail podium levels, which also include the foundations for a future tower on KLCC Lots L & M. The MRT2 project includes an MRT KLCC East Station, an underground station on Persiaran KLCC-Jalan Binjai,” the spokesperson adds. Work has commenced on the KLCC East Station. “The concourse and underground car park will be fully integrated with the MRT station, the new North-East Carpark (NEC) with ingress and egress via the new Lorong Kuda Underpass, an extension of the KLCC car and truck tunnel, which is scheduled for completion in 2020. The substructure works for the projects by KLCCH are in progress as planned, concurrently with the MRT station works by MRTC, scheduled to be completed by end-2022. “The full development of Lots L, L1, M & N envisages three commercial towers above the podium, which will only be built when full tenancy is pre-secured as KLCCH is not a speculative developer. In view of the current market situation, it is envisaged that the towers will only be built in the distant future (beyond 2030),” says the spokesperson. The estimated GDV of RM3.7 billion to RM4.2 billion is a back-of-the-envelope calculation by experts based on a 174,240 sq ft site, the current price per sq ft of office space within the KLCC area of around RM2,000 and the potential of a plot ratio of 14 to 16. “In 2012, KLCCH undertook a review of the KLCC Masterplan 1995 to enhance the development potential of the remaining undeveloped parcels. This was to ensure that the masterplan’s legacy continued in the next development phase with fully integrated, mixed-use developments and enhanced by below, on and above-grade connectivity, reaffirming the KLCC precinct as a ‘destination’ and a national symbol,” the spokesperson explains. Lot 185 is being jointly developed by KLCCH and Qatari Diar Asia Pacifc Ltd. The 50:50 joint venture is building a commercial development comprising office, retail and hotel. The hotel will be managed by hospitality group Accor Group as a Fairmont property. KLCCH, in another 50:50 joint venture with Sapura Resources Bhd, is constructing an office building on Lot 91, which will be occupied mainly by the latter. According to the spokesperson, a retail study has also been undertaken by Savills, which affirms that the retail and transport services will serve the residential community and hotel and office population in the established area of Persiaran KLCC, Jalan Binjai, Jalan Lumba Kuda and Jalan Tun Razak, in addition to an existing population of about 20,000 within the KLCC precinct. MRT2 will serve a two-million population corridor stretching from Sungai Buloh through the centre of KL to Putrajaya, and is expected to attract even more foot traffic to the KLCC precinct to complement Suria KLCC, whose annual footfall exceeds 48 million. Will the new tower add to the current oversupply of office space in KL? Adzman Shah Mohd Ariffin, CEO and chief real estate consultant of ExaStrata Solutions Sdn Bhd, opines that a proper study has to be conducted to avoid such a situation. “It is expected to take some time for the occupancy rate in the office market to improve. With the future supply coming up in Tun Razak Exchange as well as other mega developments in the fringe areas to the tune of 16 million sq ft, the vacancy rate will only improve if demand improves,” he says. Based on an expected absorption of about one million to 1.5 million sq ft per annum, it could take up to 16 years to fill the available space as well as the incoming stock, he adds. Adzman reckons that Tower M will add another three million to four million sq ft of floor area to the market. “With the current trend of office location decentralisation to the fringe and suburban areas due to congestion in the city centre and better accessibility owing to more efficient public transport, it will be a challenge to improve the take-up of office space in the city centre. The feasibility of a mega development such as Tower M may therefore need to take into account future market demand and supply in order to not end up as a white elephant,” he says.